Aplets & Cotlets and Fruit Delights, ready for giving in a celebration sleeve! 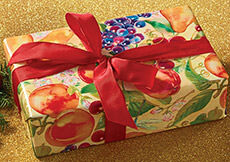 We've bound our two most popular gift boxes with a decorative foil sleeve to create our festive Gift Collection. 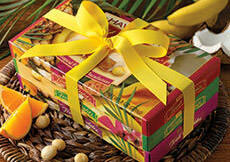 Two 14 ounce boxes and your choice of sleeve make this item the perfect gift for any occasion! Kosher. 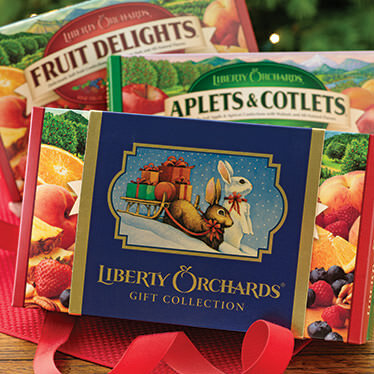 If you love Aplets, Cotlets and Fruit Delights, you will love this great value. Ms.Valenti Should Look Closer and Read the Description! 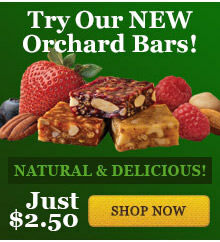 I'm not sure what the previous reviewer was talking about in the comments and the highly undeserved rating she left regarding the gift collection nothing in the Liberty Orchards Candies line deserves 1 star ! ). I t is crystal clear in the photo, and catalogue description that the order is for a 14oz.box of Fruit Delights and a 14 oz. 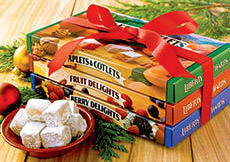 box of Aplets & Cotlets in a decorative "celebration'' sleeve ! It is only a slight savings over full price but that's secondary to the candy you receive. I care more about what is in the sleeve and there is no clear picture. I am looking for something specific you sell and have not been able to find a picture of it on line. I thought the fruit delights might be it but there was no visual.